All kinds of voter confusion on the day. All sorts of technical problems on the night and into the next morning. And by the end of a long, long election night, 146,000 rejected ballots. Exactly four months on from the Holyrood elections, a picture has emerged of an electoral 'perfect storm' where every element conspired to confuse. There were two elections on the same day - one for Holyrood, the other for local councils. Two different voting systems, one of them completely new. One new ballot paper, the other redesigned to replace two old ones. Two crosses on one ballot paper, numbers on the other. And everything counted by machine instead of by hand. The enduring image was of candidates and agents scrutinising screens showing the rejected ballots, ready to challenge the decisions of the returning officers and their staffs. But what they saw was not all they got. The assumption may have been that every ballot would be adjudicated by a human being - but that's not what happened. We have established that the e-counting machines were set to auto-adjudicate - to reject certain types of ballots automatically. They never appeared on the screens to be challenged by the parties. They were never adjudicated by the returning officer. Indeed, the last human beings to set eyes on those rejected ballots were the voters who had cast them. Then the machines took over. It is not just the parties and candidates who didn't know this was going on - never mind the voters. Some of the returning officers didn't know either. There were circumstances in which the machines would have thought they saw a Holyrood ballot paper with a cross in one column but apparently no mark in the other. The machine, set to auto-adjudicate, would count the good vote. It would then reject the other one and automatically put the ballot paper in the pile alongside all the correctly-completed ballots. In some contests that process meant more than half of all the rejected ballots were rejected automatically. There is no evidence it affected the overall result. On the other hand, there has been no human check that the machines got every single rejection right - or if not, how many they got wrong. And this was a squeakingly tight election: the SNP emerged as the biggest party by a single seat. No fewer than 16 MSPs have been elected with majorities that are smaller than the number of rejected ballots in their contest. 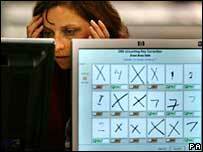 There's also the bigger question of what this does to the public's already battered confidence in electronic counting. This was a democratic election in which even the candidates, never mind the voters, were not told that machines would be deciding whether thousands of votes would be rejected. The Scotland Office, which had responsibility for the Holyrood elections, say there is no evidence to suggest the auto-adjudication caused any of the problems for voters. But First Minister Alex Salmond told BBC Scotland that he was astonished. He said: "I was under the impression - until this revelation - that the ballots that were rejected were actually seen by the election agents as part of the process. "That was my understanding. I think that's deeply disturbing. I think it's really important we get to the bottom of this."